Selling cars isn’t what it used to be. The average car buyer’s journey is different now than in years past. In the past, a prospective buyer gathered information and research through TV commercials, buying guides like Consumer Reports or Kelley Blue Book, and talking with family and friends. 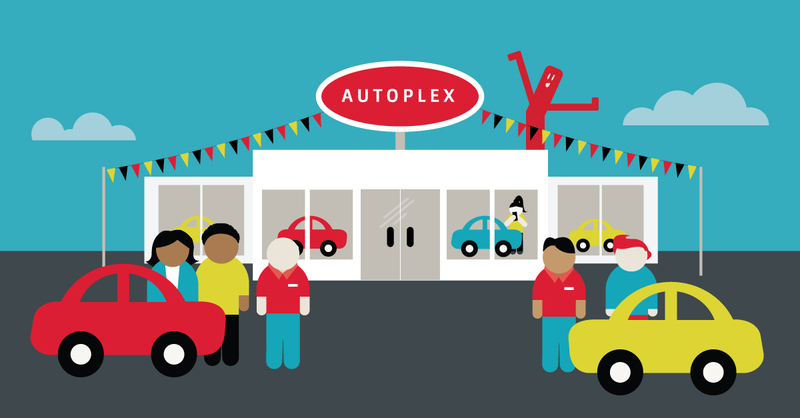 In fact, the typical buyer visited around 5 dealerships before purchasing a car. Today, that same buyer averages 2.7 visits before buying a car. People simply don’t shop around as much as they used to. The difference is the arrival of the Internet. The car-buying journey has gone online. Let’s take a brief look at a buyer’s current path to purchase. According to Geo-Marketing, 86% of car shoppers conduct research online before visiting a dealership. The average decision-making cycle from research to purchase is nine weeks, during which time spent online adds up to just over 14 hours. More than half of car shoppers are using a mobile device to help them gather information during the buying process. By the end of the online research process, a prospective buyer has all of the information they need—60% of car buyers have already decided on the brand, model, and price of the car they want before ever setting foot in a dealership. The good news is that auto marketers have a substantial opportunity to make an impression on prospective buyers with digital ads. But the question is, how best to do it? What if you could utilize your CRM and other customer data to deliver ads to individual households at the address-level? With Simpli.fi’s Addressable Geo-Fencing, now you can. Let’s say you’re a Simpli.fi client and you want to target ads directly to customers whose leases are coming up for renewal. Since you have their addresses already on file, the rest is easy. You simply upload the addresses (uploading is free) to the Simpli.fi platform. From there, we geo-fence each matched address that you uploaded so that only the households on the list are targeted. 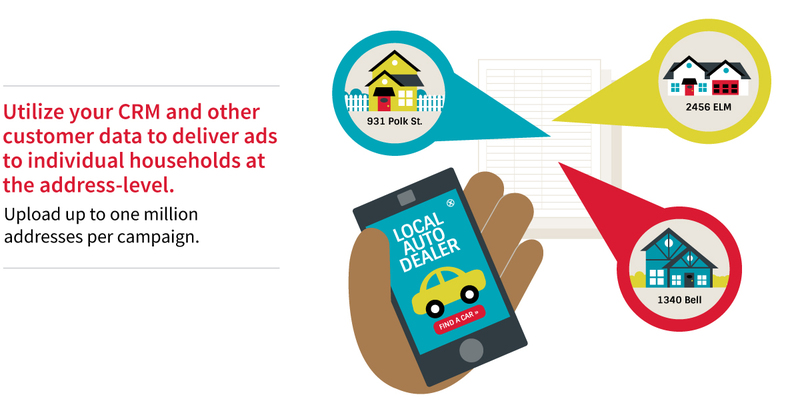 The end result is a custom audience of individual households that you can target with relevant mobile, video, and/or OTT/CTV ads that encourage your customers to visit your dealership to renew their lease. By the way, you can upload up to one million addresses per campaign. How’s that for scalability? And there are multiple other use cases for auto marketers besides lease renewals. Car purchase lists, car service reminder lists, and prospecting lists are all perfect opportunities to deploy an Addressable Geo-Fencing campaign. This is also an ideal tactic for augmenting direct mail and addressable TV campaigns. Why Settle for Broad-Based Targeting? One of the things we’re most proud of with our Addressable Geo-Fencing technology is its precision and accuracy. In terms of granularity, targeting individual households at the address-level is a huge leap forward from targeting by zip codes, DMAs, or even neighborhoods. When it comes to accuracy, we geo-fence each address using plat line data (based off of property tax and land survey information) rather than a broader and unreliable IP-based approach. By utilizing GPS latitude/longitude coordinates, we make sure we are targeting only the devices that are at the specific address. Learn more about our unparalleled precision, scale and accuracy here. Our Addressable Geo-Fencing solution gets even more powerful when you layer in Conversion Zone technology. Using Conversion Zones, you can measure online-to-offline conversions and track foot traffic to your physical location. This lets you gauge the success of your campaigns so you don’t waste ad dollars or impressions on an approach that’s not working. Simpli.fi’s Addressable Geo-Fencing is the future of a location-based marketing, and the future is now! Nothing else comes close to this level of targeting granularity. Addressable Geo-Fencing is the preeminent household-level targeting solution on the market today—it’s precise, accurate, scalable, and granular. In this case, these aren’t just buzzwords; they’re the facts. Interested in learning more about how Addressable Geo-Fencing can drive more traffic to your dealership? Check out this case study to see Addressable Geo-Fencing in action or reach out to us at hi@simpli.fi.